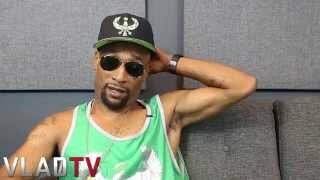 http://www.vladtv.com - Lord Jamar shares his thoughts on Bobby Shmurda's recent rise to fame, and believes that the industry is trying to make the Brooklyn rapper's music the "New NY" sound. He adds that while the song is catchy, lyrics like "Just caught a body 'bout a week ago," need to be balanced out. When asked if he buys into the comparisons between Shmurda and Trinidad James, Lord Jamar thinks that the "All Gold Everything" rapper is way worse than Bobby. He says that while the "Shmoney Dance" is "basic," he believes that Trinidad's music is beyond that point. Sep 19, 2014 · 30 comments for "Lord Jamar: Trinidad James Is Way Worse Than Shmurda"